Mystery Monument Revealed: Shadow Boxer! 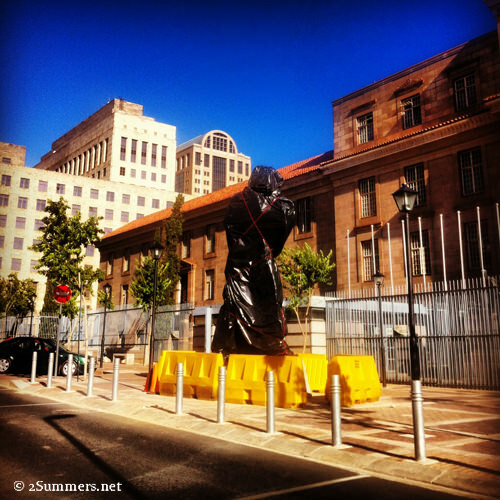 A while back I told you about a mystery monument, covered in a black tarp, in front of Chancellor House in downtown Jozi. The mystery monument in February, just after it was erected. I can’t believe this was three months ago. It took a bit longer than expected for the unveiling to take place, as often happens with official city government ceremonies. 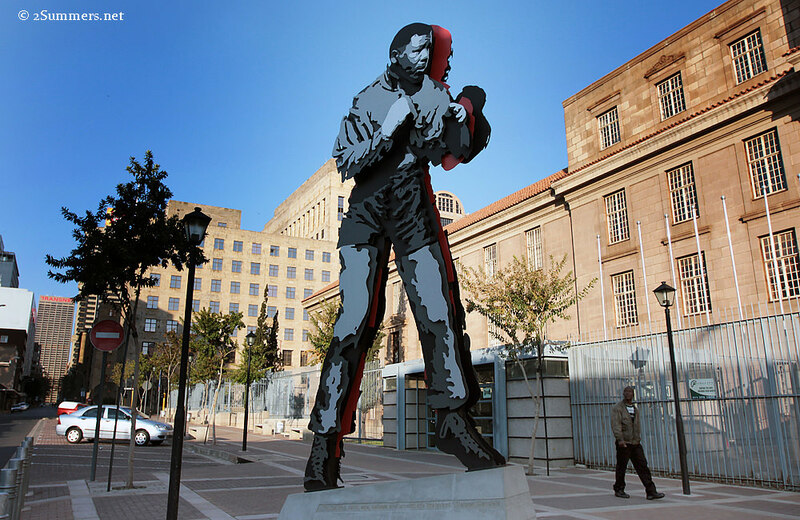 The monument was finally revealed by the mayor of Johannesburg this past Saturday. I went to see it the next afternoon. It’s glorious. 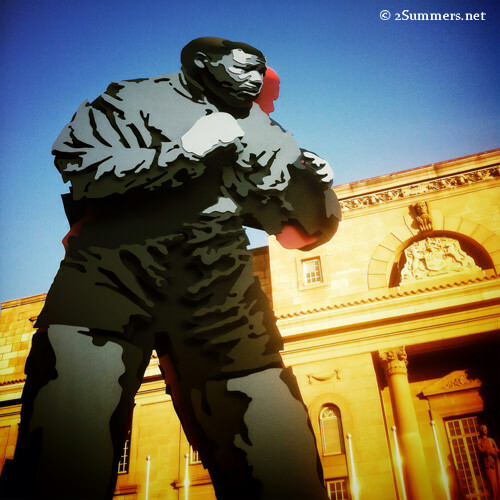 “The Shadow Boxer”, by South African artist Marco Cianfanelli. Chancellor House, the former site of Nelson Mandela and Oliver Tambo’s law firm, is in the background. The Shadow Boxer from the other side. 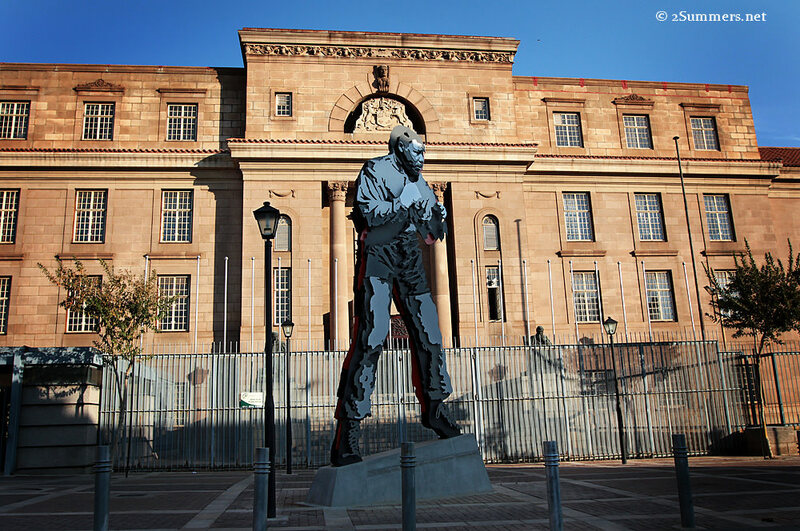 The building behind it is the Johannesburg Magistrate’s Court. 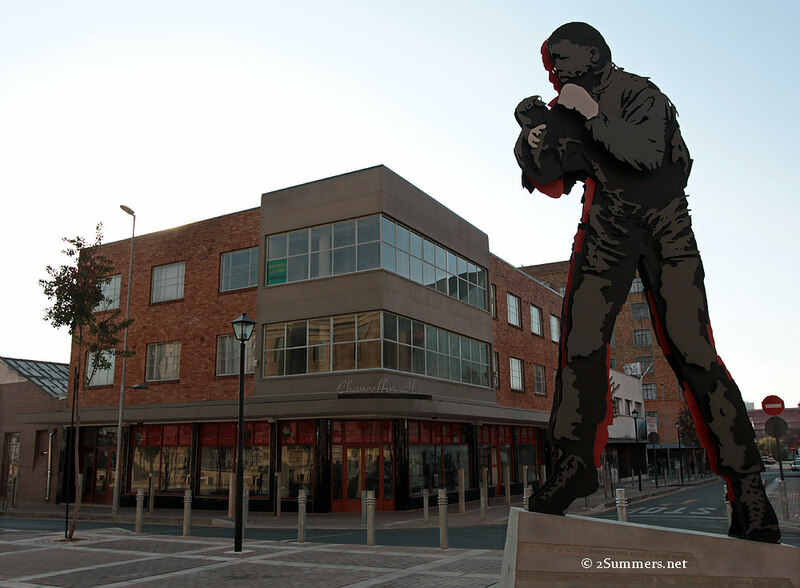 The sculpture portrays Nelson Mandela as a young amateur boxer, and is based on a famous picture by photographer Bob Gosani. 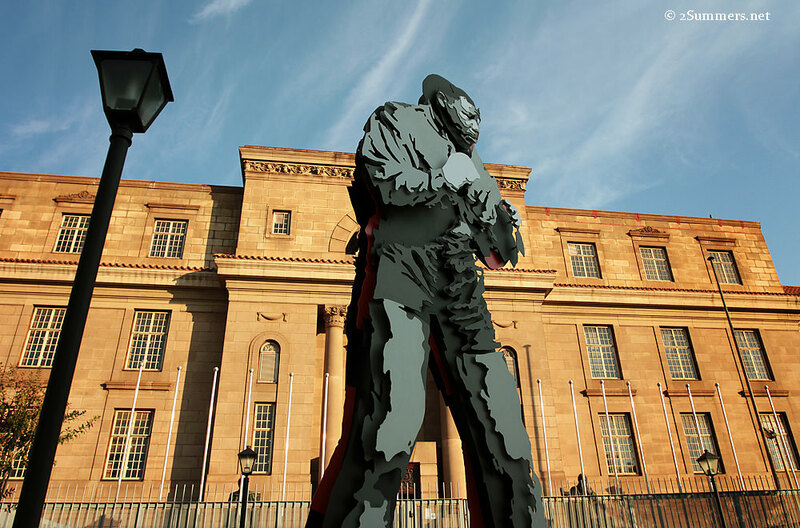 The artist, Marco Cianfanelli, is well known for another Mandela work he created in KwaZulu-Natal, at the site where Mandela was arrested in 1962 before spending 27 years in prison. 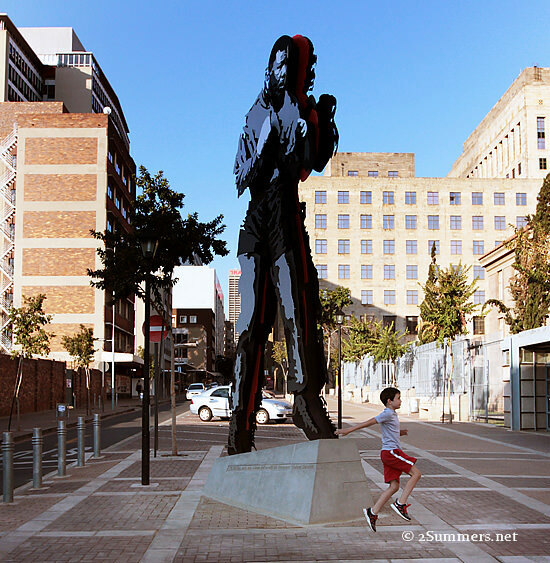 The Shadow Boxer was commissioned by the Johannesburg Development Agency in partnership with the City of Joburg. I spent quite a bit of time walking around the sculpture on Sunday afternoon, examining it from different angles and trying to photograph it. The sculpture is hard to portray in pictures. In photos the sculpture appears to be almost two-dimensional, like a photograph superimposed into a 3D movie. Examined up close, the sculpture has an infinite number of dimensions. I loved watching the reactions of passersby who hadn’t seen the sculpture before. Closeup of the Shadow Boxer’s legs. Quite a few people came to look at the sculpture while I was there, including a family with two children. By the way, the area around Chancellor House has been completely redeveloped over the last couple of years. It’s clean and safe and a great place to visit. The windows of Chancellor House have been turned into an outdoor museum where you can read about Mandela and Tambo’s legacy. The sculpture had only been unveiled for 24 hours when I was there. I like to think this might have been the first guy to pose this way beneath it. He definitely won’t be the last. I feel a particular affinity to this sculpture for a couple of reasons. First, I love photography and the sculpture is based on a photograph. 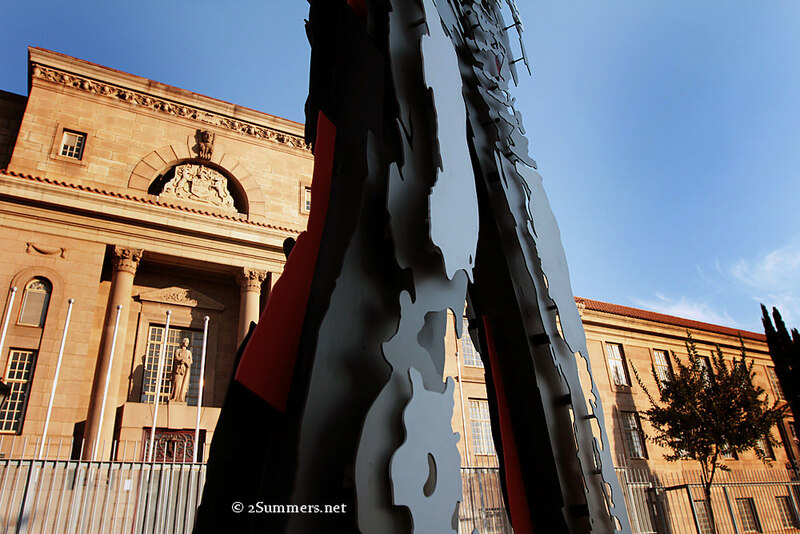 The layers of the sculpture capture the way the light hit Mandela in that famous picture. This site, at the corner of Fox and Gerard Sekoto Streets, is about to become the most popular tourist destination in downtown Joburg. Go check it out so you can say you were one of the first. Cool, so I guessed it right! Really nice statue – and another reason for visitors to wander from the Carlton Center all the way down Main Street. Yes. The CBD is getting nicer and nicer to walk in. Magnificent piece of art – great pics too. 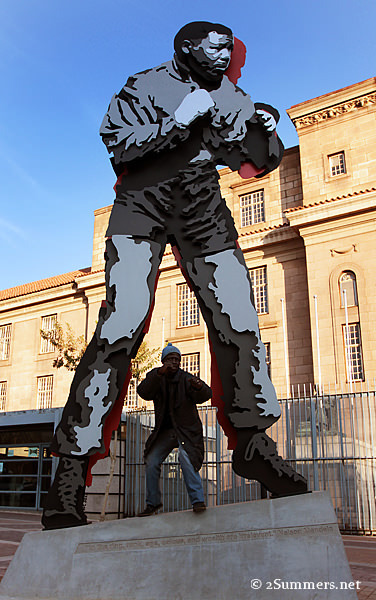 Hi Patrick, the sculpture is by Marcus Cianfanelli, a well-known sculptor in South Africa. I assume he did the steel work himself. Steven Roger-Lund and his team at Argoweld did the steel work. The steelwork was done by Steven Roger-Lund of ArgoWeld cc, who is based in Honeydew on the Westrand. Steven has manufactured a number of sculptures for Marco Cianfanelli.